No cookie says Christmas more than a gingerbread man cookie, right? They’re fun to make, fun to decorate, and even more fun to eat. Years ago when I first started experimenting with gingerbread men recipes, I made one truly terrible batch from a recipe in my favorite 1974 edition of the Joy of Cooking. That recipe called for 1/4 cup of butter for 3 1/2 cups of flour, and the result, as you might expect, had more structure than taste. My guess is that the Joy cookie was originally developed to be a tree ornament, and while there is nothing wrong with cookie tree ornaments, I wanted gingerbread men and women I could EAT. This is the recipe I developed after much experimentation; it has stood the test of time, and produces cookies that are a joy to eat! They’re deeply flavored with spices and molasses as any good gingerbread should be, and sweet enough to be a proper cookie. What would a cookie be without a secret ingredient? The spice that really makes this cookie sparkle is a scant amount of finely ground black pepper. I know we don’t usually think of adding pepper to something sweet, but trust me, it works. I bake these cookies so they are more tender than crispy. If you want a little snap to them, just cook them a bit longer. Updated December 25, 2018 : We spiffed up this post to make it sparkle! No changes to the recipe. 1 Whisk together flour, baking soda, spices: In a large bowl, vigorously whisk together the flour, baking soda, and spices. Set aside. 2 Make the dough: In an electric mixer fitted with the paddle attachment, beat the butter until light and fluffy. Add sugar and beat until fluffy. Mix in eggs and molasses. 3 Chill the dough: Divide dough into thirds; wrap each third in plastic. Chill for at least 1 hour or overnight. 4 Roll out dough, cut shapes: Heat oven to 350°F. Place a dough third on a large piece of lightly floured parchment paper or wax paper. Using a rolling pin, roll dough 1/8 inch thick. Refrigerate again for 5-10 minutes to make it easier to cut out the cookies. Use either a cookie cutter or place a stencil over the dough and use a knife to cut into desired shapes. 5 Transfer to baking sheet: Transfer to un-greased baking sheets. Press raisins, chocolate chips, or candy pieces in the center of each cookie if desired for "buttons". 6 Bake: Bake at 350°F until crisp but not darkened, 8 to 10 minutes. Remove from oven. Let sit a few minutes and then use a metal spatula to transfer cookies to a wire rack to cool completely. Decorate as desired. The traditional way to make Royal Icing is to beat egg whites and lemon juice together, adding the powdered sugar until the mixture holds stiff peaks. With modern concerns about salmonella from raw eggs, you can either use powdered egg whites, egg whites from pasteurized eggs, or you can heat the egg whites first to kill any bacteria. If the icing is too runny, add more powdered sugar until you get the desired consistency. Fill a piping bag with the icing to pipe out into different shapes. (Or use a plastic sandwich bag, with the tip of one corner of the bag cut off.) Keep the icing covered while you work with it or it will dry out. Hello! All photos and content are copyright protected. Please do not use our photos without prior written permission. If you wish to republish this recipe, please rewrite the recipe in your own unique words and link back to Gingerbread Men Cookies on Simply Recipes. Thank you! So I didn’t realize that the molasses I used was blackstrap molasses until after I had finished making the dough. Now my cookies taste a bit bitter and not sweet enough possible because i didnt pack the brown sugar. Is there any way to fix it? Hi, Quinn! Oh dear! I’d slather these cookies with some sugary icing! Flavoring the icing with some lemon zest would also be a nice compliment to the dark flavor of the molasses. Hope this helps! I’ve been making these every Christmas for the past five years at least. Everyone loves them, my kids ask for them. Can’t have Christmas without these cookies! Thanks Elise! You’re welcome Anca, I’m so glad you like them! Best damn gingerbread cookies I have even made. Made them with granddaughter, so much fun. When my daughter-in-law came home she so loved them. She’s a baker by profession. Did my heart good to have them all disappear. great recipe! nice spice to this cookie & dough was easy to work with. I made minis on a 325 oven for 6 minutes and that was just right for a soft chewy texture. note: I made w/ cup4cup GF flour. Hi Emily, the recipe makes about 2 dozen cookies that are about 3 1/2 inches tall. Excellent gingerbread recipe – best one yet – definitely a keeper! I only had Blackstrap Molasses so I used ½ of amount called for and the other ½ I substituted Dark Caro Syrup – not bitter at all and worked well with the amount of spice! Great consistency to roll out as well – will be a tradition going forward. Smelled so good while they were cooking too! Great! I’m so glad that sub worked for you. I triple the recipe because gingerbread cookies are my dad’s favorite & this will be my first Christmas with him in 7 years…but the dough is so crumbly! Should I add more butter? Flour? HELP! Hi Khristina, hmmm, this is already a pretty big recipe. Tripling it would mean you used close to 10 cups of flour! You must have a huge mixer. I wouldn’t add more flour at this point. Perhaps just add a teaspoon at a time of water, until the dough comes together better. Hi Elise! I used the largest mixing bowl I have, folded in the flour & actually incorporated the last cup plus manually. I realized, going over the recipe again, that I grossly miscalculated the butter. I’ll try to incorporate it as the dough & butter both come up to room temp. Thank you & Merry Christmas! I know this comment is a year old, but I will provide this info in case anyone else experiences this problem. The same thing happened to me with a similar recipe that I had doubled. It was so crumbly that it wouldn’t stick together at all. I realized that I had miscalculated the margarine amount needed, so all I did was melt that additional margarine in the microwave, and drizzled it into the cookie dough while stirring it vigorously. It came out perfectly! So, easy fix, and I believe a better addition than water, which isn’t usually used in cookie recipes. Hope this helps. These turned out really awesome. This would be our standard gingerbread man cookie recipe going forward! Thanks so much. It’s amazing how I can always rely on your website! I’m so glad you liked it Reir! Hi Steffanie, you don’t plan on eating the cookies? May I ask why not? They’re so good! These cookies were designed to be eaten. As for margarine, I haven’t tried making the recipe with margarine, so don’t know what to tell you. If you do make them with margarine, please let us know how they turn out for you. Whoops! I thought I was commenting on your gingerbread house recipe! Not even sure how the comment ended up on this page?! My mistake! Looking forward to trying this recipe over the holidays. Wondering why you say not to use blackstrap molasses. I have a quart jar of it and don’t want to get more if I don’t have to. Maybe I could use 1/2 blackstrap and 1/2 golden syrup? Thanks! Hi Val, blackstrap molasses can be very bitter, for some people too bitter to use in these cookies. Hi Jelena, I do not recommend replacing the molasses with honey. Instead, you might want to cut the amount of molasses in half if using blackstrap. Just finished making these. Yesterday, I tasted the dough and thought, “Not enough ginger.” But today I baked them, and they are really good, but if you like spicy cookies, add 1/2 tsp of ginger or more pepper. I like them crispy rather than chewy, so upped the time to 14 minutes and cut them rather thin. I tried this recipe tonight and it worked wonderfully! I used the royal icing recipe, which has hardened nicely on the cookies by now. So, I’m wondering about storing the cookies. Do they need to be stored in air tight containers? Also, I put the left over icing in the fridge in a plastic bag and I’m getting the impression that it won’t keep until tomorrow, when I hope to finish frosting them. So, I’ll probably go ahead and make an extra batch when I’m ready. Although my family made over a dozen types of cookies every year at Christmas, we had no tradition of gingerbread. The last time I was asked to make gingerbread cookies, it was horrible. The dough was probably fine but the rolling and cutting was impossible. For this, I followed the recipe EXACTLY except for the pepper. My spice grinder finally gave up and I couldn’t get the pepper fine enough for this kind of thing. Also, for my first batch I skipped the second chilling step, and regretted it. For those who have not tried to make gingerbread men before, I would strongly recommend following the instructions carefully on chilling. It makes the difference between nightmare and just making tasty cookies. I followed the recipe exactly (except that I did raisins, no icing). They were easy to roll out. I baked them on the softer end of the time spectrum. Spice cookies are often best the next day and this was true here. Fabulous texture. But just pretty good flavor. I love molasses cookies but these should have tasted more of ginger since they’re gingerbread and for the holidays. Next time I will bake slightly crisp (one minute more), reduce molasses and increase ginger, and press the raisins in more firmly. Otherwise great. Hi, I just wanted to thank you for posting this amazing recipe. I made gingerbread men for this christmass and couldn’t believe how great they were! I loved the spicy and softly sweet flavor, also the texture was great. I replaced molasses with honey, because I ran out of it and didn’t notice until I start cooking, but it didn’t mean a problem. Also, I didn’t use black pepper and instead added an extra ginger tablespoon. Thanks again, I’m visiting your blog again if I need to cook something for sure! Just made those cookies, and loved the texture even though I messed it up a little when I added baking powder instead of baking soda first. Then I thought for a minute and added baking soda anyway. I only had a 1/4 cup brown sugar left so my men tuned out lighter than in the picture. I’m no expert in gingerbread but the cookies taste a little too much like pumpkin pie/bread too me. I might experiment with the spices the next time. Thanks for a good recipe! Thank you for a wonderful recipe. 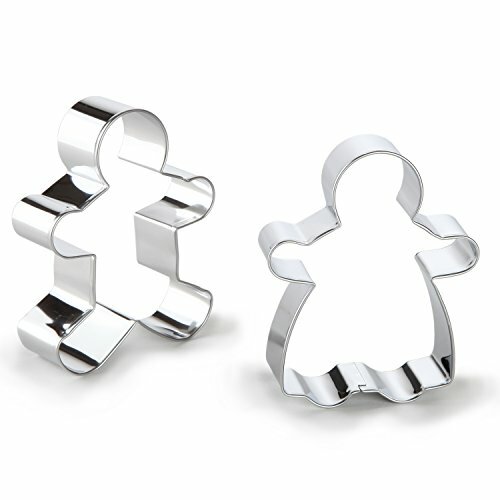 I agree – I made the Joy of Cooking Gingerbread men a few years ago and they were inedible! (And I have the newer edition.) Though I do a lot of baking I have had a disproportionate number of gingerbread disasters. These however, were a big success! I made a double batch for my daughter’s Christmas program because she really had her heart set on gingerbread men. We decorated them together with royal icing and all the kids loved them. The smell alone I think qualifies as aromatherapy. I had the best luck rolling the dough on waxed paper, and baking them on parchment paper. Thanks for the recipe, it’s in my file now! (PS- I found my gingerbread man cutter at a flea market. He stands a little shorter than the template, and I got about 3.5 dozen from a single recipe). Thanks for the lovely cookies! I made these with my 3-year-old son today. It was the first time making gingerbread men (for both of us) and we had a blast. I ended up not using the icing and just using dried fruit for eyes/buttons. I made four batches out of the dough. The first two batches turned out to be too crispy because I kept them in the oven too long. I had followed the recipe’s advice about keeping them in the oven until they were crispy and that resulted in the cookies being a little bit too crispy after they had cooled down. So, for the last two batches, I took them out after 10 minutes no matter how soft they were. That worked perfectly. They hardened a little bit during the cooling process, so they were crispy but not too hard. Overall, a great recipe and one that is sure to be a Christmas staple in our family. Thanks Elise!